With advanced DSP technology and Fast Fourier Transform algorithms this instrument provides a new level of performance and versatility. In addition, the GP102 PAV is competitively priced compared with other traditional PAVs. Specifically targeted at the Synchro/Resolver and LVDT/RVDT marketplace this instrument makes measurements of Phase Angle, In-Phase, Quadrature (90° component), Fundamental and Total Vrms very straightforward. All these measurements are displayed simultaneously on a bright multifunction display. The readout can even be zoomed to enlarge any selected measurement. Isolated inputs allow null, ratio (in-phase, quad, fund, total rms, sum+difference) and gain measurements of key parameters and a reference offset facilitates bridging measurements. A sensitive null meter is included for precise nulling. 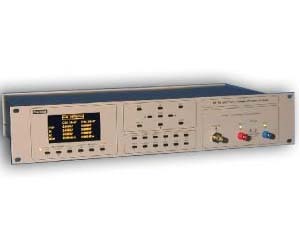 An on-board reference generator (with optional amplifier) eliminates the need for an external reference; although the unit can be used with an external generator. Using an optional switching matrix (TAF01-U), LVDT, RVDT and resolver measurements can be automated.